More time for race-specific practice. A reduced distance program has both a sound physiological basis and numerous skill-learning advantages. As the majority of swimming events require a relatively short amount of performance time, an emphasis on power production (as opposed to training distance) is vital to maximize these swim performances. While reduced training distance is consistent with the most specific physiological emphasis, swimmers also benefit from technique improvements. The assumption that “more is better” needs to be re-evaluated by coaches. 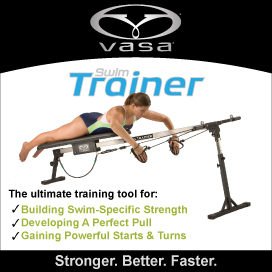 Click to read the complete article posted on Swimmingworld.com.